Someone recently shared this photoshop tutorial with me about "drawing realistic mouths". As impressive as the digital techniques they showcased were, I thought it could also serve as a wonderful illustration of facial anatomy. Watch the tutorial, then meet me below the embedded video for some discussion of the lessons we can take from it. The mouth is a complex little landscape of hills and valleys. Parts of it are gently sloping. Parts of it cast deep shadows. There is a lot to know and understand here, but as this video demonstrates, you can get great results by remembering a few basic facts about the mouth. The anatomy is perhaps best illustrated by looking at the face from the side. 1: In both males and females, the lips protrude slightly from the rest of the face. This causes an "edge" on the upper lip, a tiny plane that catches the light. This effect is very subtle, and should usually only be indicated by a highlight or two where the light most intensely catches the face, rather than drawing a big, clown-like white outline around the entire top lip. 2: The top lip typically juts out and then slopes back in toward the mouth, leaving it gently in shadow and darker than the surrounding skin. This is compounded by the fact that the skin of the lips, in any light, is typically a few shades darker than other facial skin. This difference is often somewhat fuzzy around the edges of the top lip -- probably why the artist in the video uses the Gaussian blur effect so often. 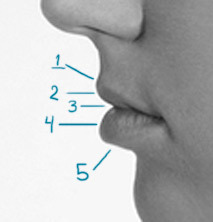 3: The bottom lip is a curved object. At first, where it begins, almost touching the teeth inside the head, it is beneath the top lip, and the top lip casts a dramatic shadow onto the bottom lip. In the video, you can easily see this illustrated - the artist used an almost perfect black to create this shadow. 4: But very shortly, the bottom lip swells out, catching the light. There is almost always a highlight - often a bright one - in the center of the bottom lip in both males and females. In females, the bottom lip more commonly swells out further than the top lip. 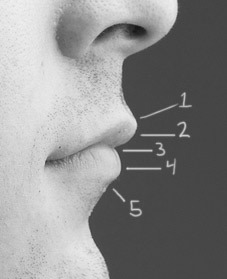 In men, the bottom lip may or may not push out further than the top. 5: And finally, the bottom lip creates a "cliff" where it overhangs the chin, creating another deep shadow. The center of the lips are where the most steep angles are found. The shadow cast below the bottom lip is typically deepest in the center, and lighter to the sides. This is a very simple overview of the shape of the mouth, but I hope it helps you to conceptualize the above video not just as an illustration of a photoshop formula, but as a demonstration of some basic facts about the way lips catch light that allows you to carry those ideas into other images. Remember: Lips are dramatic! Don't be afraid of going dark. Mouths are actually complex shapes and throw some gorgeous shadows. If you want to do some serious practice of the mouth, consider starting a 100 project and joining us on the forums to keep accountable and monitor your progress. This entry was posted in Deeper understanding of anatomy. Comments on "Drawing realistic mouths"
You're very welcome! I hope it helps. I don't see any embedded video.Just a blank space. Please, someone help with this?